If you and your pals love to hang out where sun, fun and sand are found in abundance, the 3 friends at the beach ornament is perfect. Whether the beach is a favorite local hotspot or a coastal stretch in some exotic destination, this decoration captures the great memories you have of the time spent together. 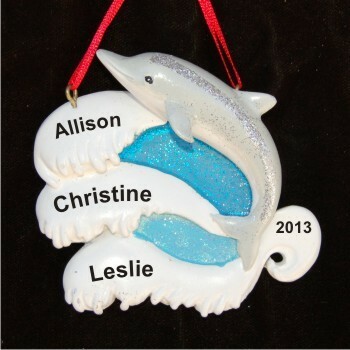 It's one of our travel & beach ornaments personalized with your details to make it a cherished treasure. Having one produced for each of your trio can be done at an affordable price. The 3 friends at the beach personalized ornament arrives in our custom velvet gift and storage pouch. For me and vacationing friends Dec 17, 2014 Heather G.